Every day we’re asked to recommend related auto-repair services. This page lists our business partners. Each business listed here comes with our highest recommendation. We have personally worked with these businesses and continue to work with them on an ongoing basis. Are you looking for a service like Smart Finish in Adelaide? You can get all SMART Car repairs – including paint repairs, alloy wheel repairs, bumper repairs and more – from our business partner in Adelaide. 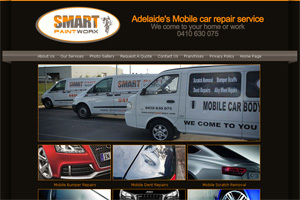 We recommend Paintworx – www.smartpaintworx.com.au – for mobile vehicle repairs in Adelaide. Click here for more. 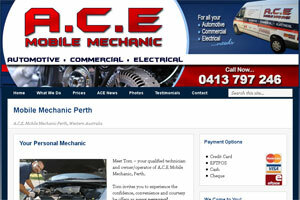 Mobile Mechanic Perth – A.C.E. Mobile Mechanic When it comes to service, A.C.E Mobile Mechanic is second to none. Tom is an expert, reliable, friendly mechanic whom we trust to look after the Smart Finish van, as well as our personal vehicles. Call A.C.E Mobile Mechanic for all your warranty servicing, vehicle inspection, engine repairs and general maintenance. 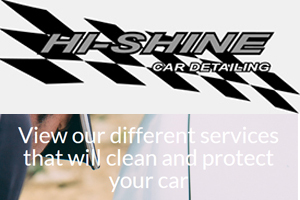 Perth Car Detailing – Hi-Shine – If you care about your car, call Nathan from Hi-Shine Car Detailing. Servicing most suburbs in the Perth metro area, Hi-Shine detailers have a level of expertise beyond your average detailers. From basic clean and wash to full paint restoration, you can expect outstanding workmanship every time. Dent Removal without Paint Repair = Paintless Dent Removal Many times, dents are just dents – with no paint damage. These can be fixed without paint touch-up or respray. In these cases, we highly recommend Dent Man for car dent repairs in Perth, Western Australia. Dent Removal with Paint Repair = Dent Man and Smart Finish – Of course, there are other dents that are accompanied by scratched or chipped paint. In these cases, Dent Man can repair the dent, and Smart Finish can repair the paint. We can work side by side on jobs like these. Dent Removal without Paint Repair = Paintless Dent Removal (PDR) by Dent Man. As discussed above, when dents are just dents without paint damage – they can be fixed without paint touch-up or respray. 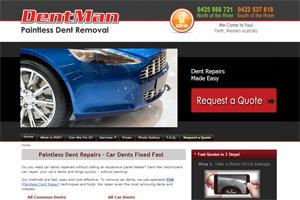 In these cases, we highly recommend Dent Man for car dent repairs in Perth, Western Australia. Dent Removal with Paint Repair = Dent Man and Smart Finish – As above, for dents that are accompanied by scratched or chipped paint, Dent Man can repair the dent, and Smart Finish can repair the paint. We can work side by side on jobs like these. Autosource.com.au is an Australian car & automotive website directory. Are you looking for body shops, scratch repairs, car parts, car dealers, car clubs? We recommend this resource to anybody looking for anything automotive. You’ll discover all kinds of Aussie car or automotive related businesses, clubs or websites at Autosource.